Back in June, when I was on holiday in Orkney, I broke the lens for my Canon DSLR camera and I was gutted. Taking photos is one my favourite hobbies and new lenses are quite expensive - not something I could just pop out and buy without saving my pennies first. However, saving my pennies is what I've been doing and I've just got a new lens. I'm really delighted with it. I looked into getting the old lens repaired under my holiday insurance, but I would have had to pay a £50 excess anyway. Instead, I decided to upgrade to a better one. My old lens was 18-80mm, the new one is a Sigma 18-250mm. It will be great for taking pictures of wildlife, I hope. When it arrived, I immediately tried it out. 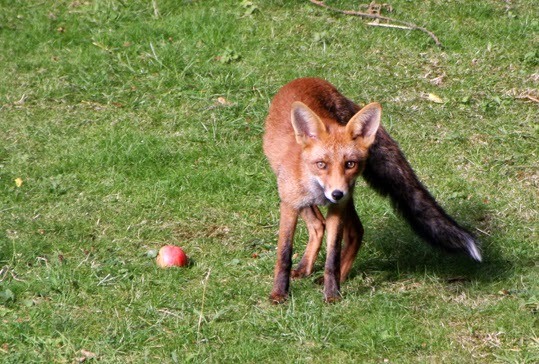 This fox was at the end of my garden, so I took this photo of it from the my bedroom window. Let's just hope we have a lovely autumn so I can get out and take more pictures!